Had World War II continued indefinitely, Carden Gillenwater might have fashioned a noteworthy major-league career. 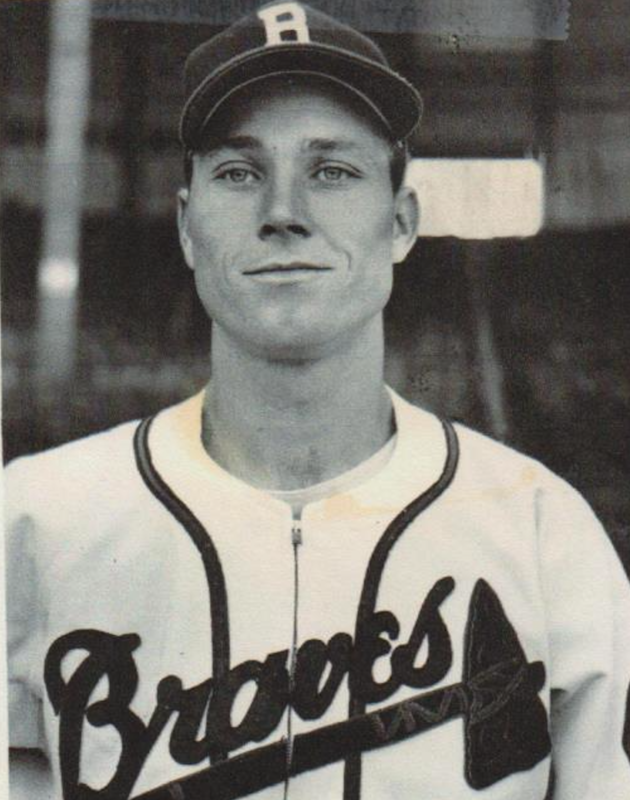 As a member of the 1945 Boston Braves, he posted solid offensive numbers and led National League center fielders in several fielding categories. But the return of baseball’s elite for the 1946 season soon relegated placeholders like Gillenwater back to the bushes. Apart from a stint as a part-timer for the Washington Senators in 1948, Gilly was remanded to high-tier minor leagues until he hung up his spikes at the end of the 1954 season. Thereafter, he and his wife relocated to Clearwater, Florida, where they operated a chain of retail fabric stores for 25 years. After an active, travel-and-golf-filled retirement, Gillenwater was stricken with ALS (Lou Gehrig’s disease) and died in a Florida nursing home in May 2000, just days short of his 83rd birthday. Two months after his belated graduation from Knoxville High in January 1937, the soon-to-be 20-year-old Gillenwater reported to the Cardinals’ spring camp and attracted almost immediate notice. Although young and raw, Carden Gillenwater just looked like a ballplayer. Good-sized (6-feet-1,6 175 pounds) and athletic, the right-handed youngster was blessed with the foot speed and strong throwing arm of a top-notch outfielder and quickly impressed with his defensive skills. But his hitting, particularly a lack of extra-base power, made Gillenwater something of a project. Assigned to the Kinston (North Carolina) Eagles, a Class D affiliate of the St. Louis club, he got off to a good start, batting .301 with a surprising 14 homers (a figure that he would not reach again until the 1944 season). Carden Gillenwater made his major-league debut in the first game of a September 22 doubleheader against the Chicago Cubs. With the Cardinals cruising to an 8-1 win, manager Billy Southworth sent Gillenwater out to relieve center fielder Terry Moore during the late innings. He then made his debut a complete success by singling off reliever Clay Bryant in his first major-league at-bat. Before the St. Louis season was over, Gilly made six more game appearances, finishing with an underwhelming .160 (4-for-25) batting average and five RBIs. His play in the outfield, however, was flawless, with 12 chances accepted without a misplay. Gillenwater attended the Cardinals’ 1941 spring camp, but was optioned to Columbus (Ohio) of the Double-A American Association in early April. Days before the season began, Gilly formed an association of a different order: He married 22-year-old Marian King of Knoxville. Their union would be a long (59 years) and happy one, but produced no children. Once the country entered World War II in December 1941, the military draft status of professional ballplayers became a front-office concern. But for the time being, married men like Gillenwater were not immediate conscription targets. He reported to New Orleans for spring training but got off slowly in 1942, set back by surgery in March to remove three bone chips in his throwing elbow.13 He returned to the lineup early in the regular season, but his final stats, a .273 batting average with four homers in 499 at-bats, again failed to impress. With his career seemingly headed in the wrong direction, Gillenwater revived his prospects with a sterling 1943 campaign. Not only did he remain “one of the finest fielding outfielders in baseball,”14 Gilly began hitting. Despite being sidelined for weeks with a broken hand, he posted a .333 batting average with 30 extra-base hits in 109 games for New Orleans. That September the manpower-strapped Brooklyn Dodgers purchased his contract.15 With the Dodgers well out of pennant contention, Gillenwater was among the club newcomers thrown into action by manager Leo Durocher. In eight games, Gilly batted a meager .176 (3-for-17), but handled himself capably in the outfield. Given wartime conditions, it was enough for Brooklyn to reserve him for the 1944 season. When the Dodgers reassembled for spring camp, Carden Gillenwater was among a host of roster members classified as 4-F, registrant not qualified for military service.16 The basis for this classification is uncertain. According to New York Times sportswriter Roscoe McGowen, the disqualification was “probably a result of a severe head injury [Gillenwater] suffered while playing centerfield for Rochester in an exhibition game several years ago.”17 A more likely basis for the 4-F classification was the significant hearing loss that Gillenwater suffered after a minor-league beaning by Hod Lisenbee.18 Whatever the basis, Gilly’s exemption from military duty greatly enhanced his chances of sticking with Brooklyn. But with a surplus of outfield candidates in camp, Gillenwater was deemed expendable and was optioned to the St. Paul Saints, the Dodgers’ affiliate in the American Association. After a one-game appearance for Syracuse in 1954, Carden Gillenwater’s final professional season was completed with the Schenectady Blue Jays of the Class A Eastern League. Upon leaving the game, he and his wife settled in Clearwater, Florida, where they operated Gil-Mar Fabrics, a chain of retail fabric and drapery stores. When they retired from the business world some 25 years later, the Gillenwaters devoted themselves to travel and church work. Carden, an avid golfer, also organized local charity golf events. As he grew elderly, Gillenwater was stricken with amyotrophic lateral sclerosis (ALS or Lou Gehrig’s disease), an incurable motor neuron disorder that slowly incapacitates its victims. As the end neared, he was placed in Cypress Palms Assisted Living Facility in Largo, Florida.32 He died there on May 10, 2000, three days short of his 83rd birthday. Upon his passing, Marian Gillenwater remembered her husband of 59 years fondly: “It didn’t matter if it was marbles, golf, tennis, or baseball, sports is all he knew. He was a great person, my best friend. Just a real good guy who loved sports.”33 Funeral services were conducted at St. Paul United Methodist Church in Largo, where Gilly had long been a member. His remains were cremated. Survivors included his wife and several nieces and nephews. Sources for the biographical info provided herein include the Carden Gillenwater file maintained at the Giamatti Research Center, National Baseball Hall of Fame and Museum, Cooperstown, New York; US Census, Florida city directory, and Gillenwater family data accessed via Ancestry.com; and certain of the newspaper articles cited below, particularly the Gillenwater obituary published in the St. Petersburg Times. Stats have been taken from Baseball-Reference. 1 A West Coast columnist once observed that the name Carden Gillenwater “seems like something dreamed up by a perfume salesman.” See “By the Way, with Bill Henry,” Los Angeles Times, July 10, 1948. Actually, our subject’s uncommon first name was his mother’s maiden name. Years later, Carden purportedly maintained, “They named me after my mother because I was the youngest brother of eight and by that time they’d run out of names,” per an unidentified May 1948 news article in the Gillenwater file at the Giamatti Research Center. His surname was most likely Gaelic in origin, Gillenwater being a corruption of O Giollain, taken from the Irish word for lad. See Gillenwater Surname, Family Crest & Coat of Arms on the House of Names website. 2 The older Gillenwater children were Della (born 1894), Alline (1895), William (1897), Karl (1901), Charles (1904), Paul (1906), David (1910), Phillip (1912), and Max (1915). Claral Gillenwater, a five-game pitcher for the 1923 Chicago White Sox, was no relation. 3 As per an unidentified early-1946 profile contained in the Gillenwater file. 4 As recounted decades later in the St. Petersburg Times, May 14, 2000. See also, Baseball Heaven, My Hero: Carden E. (Gilly) Gillenwater, on the LovedOnes/Memorials.com. website. 5 St. Petersburg Times, May 14, 2000. 6 In the questionnaire that he completed for the Hall of Fame library, Gillenwater listed his height as 6’2”. 7 As reported in the (Jersey City) Jersey Journal, September 10, 1938. The surgery was performed at St. Michael’s Hospital. 8 As per the Jersey Journal, August 9, 1938. Rickey reportedly placed a $10,000 sale price on Gillenwater, while simultaneously informing other clubs that neither he nor pitching prospect Ken Raffensberger was for sale. 9 The Sporting News, May 9, 1940. 10 As reported in the Sacramento Bee, September 11, 1940, and newspapers nationwide the following day. In order to make room on the roster for Gillenwater, the Cardinals ended the comeback attempt of one-time star catcher Bill DeLancey, who was made a coach. 11 Columbus sent Gillenwater and pitcher Ed Wissman to Rochester in exchange for pitcher Charlie Brumbeloe and outfielder Augie Bergamo. 12 As reported in the (Little Rock) Arkansas Gazette and New Orleans Times-Picayune, December 17, 1941. 13 As noted in the New Orleans Times-Picayune, March 14, 15, and 19, and June 28, 1942. 14 New Orleans Times-Picayune, May 27, 1943. 15 As reported in the New Orleans Times-Picayune, Omaha World-Herald, and Washington Evening Star, September 19, 1943. 16 See the Macon (Georgia) Telegraph, February 16 and 20, 1944, and Canton (Ohio) Repository, April 10, 1944. 18 As per the May 1948 news article cited in endnote 1, above. 19 As reported in the Baton Rouge State Times Advocate, (Boise) Idaho Statesman, and Rockford (Illinois) Morning Star, August 29, 1945, and The Sporting News, September 7, 1945. 20 As reported in the Boston Herald, Chicago Tribune, and New York Times, February 25, 1945. 21 As per The Sporting News, March 8, 1945. 22 In 1944 Workman had batted a mere .208, with 11 home runs and 53 RBIs. 23 The Sporting News, November 1, 1945. 24 As reported in the Chicago Tribune and Dallas Morning News, January 26, 1947. 25 As reported in the Chicago Tribune and Dallas Morning News, October 7, 1947, and Washington Post, October 8, 1947. 26 As reported in the Cleveland Plain Dealer and Columbus (Ohio) Dispatch, October 29, 1947. For more detail on the Chandler ruling in the Gillenwater case, see The Sporting News, October 29, 1947. 27 As reported in the Dallas Morning News, Los Angeles Times, and New York Times, May 13, 1948. 28 As per The Sporting News, July 14, 1948. 29 As reported in the Boston Herald, August 14, 1948. 30 See The Sporting News, October 6, 1948. Commenting upon the transaction, longtime Washington sportswriter Shirley Povich observed that Gillenwater had not been the answer to the Senators’ outfield needs. 31 Gillenwater was posthumously honored by the Syracuse Chiefs in 2004. 32 As per Gillenwater’s obituary in the St. Petersburg Times, May 14, 2000. 33 Ibid. Marian King Gillenwater died at age 87 in 2005.